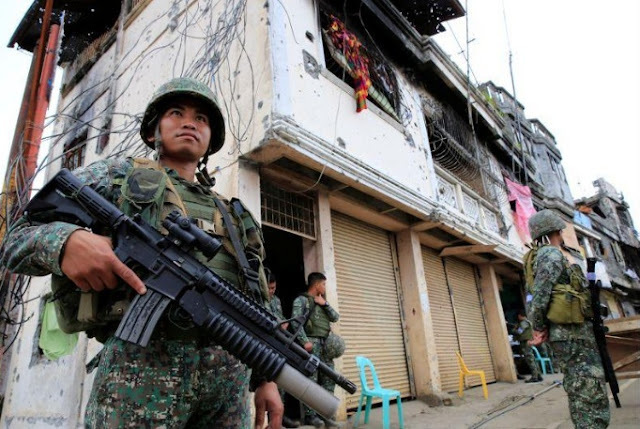 FILE PHOTO: Government soldiers stand guard in front of damaged building and houses in Sultan Omar Dianalan boulevard at Mapandi district in Marawi city, southern Philippines September 13, 2017. MANILA - Philippine President Rodrigo Duterte on Tuesday declared Marawi City liberated from pro-Islamic State militants who have held the heart of the city for 148 days, media and a government minister said. Duterte was visiting Marawi, a day after two leaders of the rebel alliance were killed. Reporters from CNN Philippines and ABS-CBN said Duterte made the statement to soldiers in the city. Duterte’s remarks were also relayed in a text message to reporters by Presidential Communications Secretary Martin Andanar. Philippine President Rodrigo Duterte on Tuesday declared Marawi City liberated from pro-Islamic State militants who have held the heart of the city for 148 days, media and a government minister said.